My girlfriend shared this story with me today. I knew I had to make a post after seeing this amazing PHOTO BOMB! 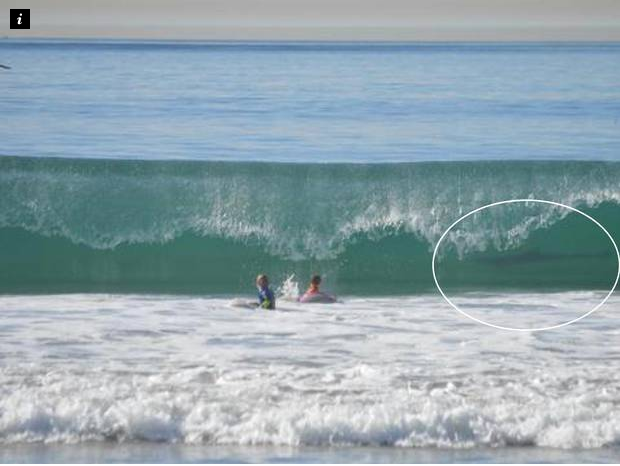 i want you to Imagine taking your kids to the beach, and then seeing what looks like a GREAT WHITE SHARK a few feet away. I’m sure it will make any parent totally FREAK OUT and of course worry about the safety of their kids. However in this surreal picture, the kids nor the mom even noticed the Great White Shark casually swimming by doing his own thing until AFTER they left the beach! It is known that Great White Sharks generally don’t swim near the beaches nor do they attack unless they feel threatened or provoked. ANYWAYS, There has been numerous videos of Shark sightings in the area, most recently from a surfer that posted a video on youtube a few months back at the same beach.